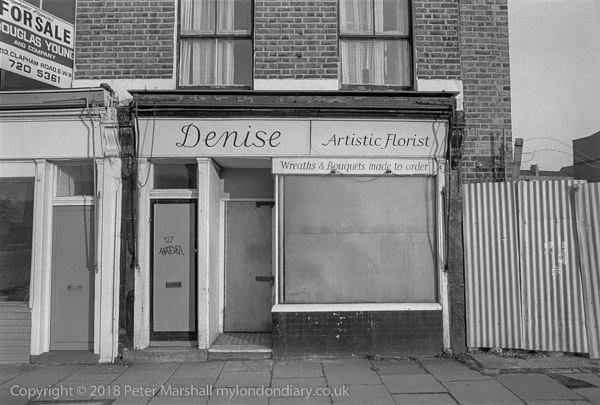 I can't place the exact location of 'Denise Artistic Florist', though the few frames immediately prior were taken inside an empty area on the Thames immediately east of Vauxhall Bridge. Four years later that site as bought by developer Regalian. Terry Farrell won a competition to develop it, and his architectural folly was bought by Margaret Thatcher as the HQ for the Secret Intelligence Service MI6. Apparently we only see half the building which has huge facilities underground - and possibly even a secret passage to Westminster. It seems odd to have such a flamboyant front for our secret intelligence service, and I rather feel it would have been better to have kept something like Denise as a front, with our agents emerging carrying bunches of flowers. But if anyone bought the Freehold Premises which were for sale from Douglas Young and Company, I suspect it was to knock them down and build something new.